Welcome to our RTS page! Over the past several months, we have added many new and exciting items to our inventory specifically for your type of coach. We currently have many, many more items for your vehicle than we can possibly list here. We stock items for your air, air conditioning, engine, lighting and electrical systems, just to name a few areas. We have a significant number of body panels, ready to be put directly onto your coach! Our BASIC PARTS CATALOG - SUMMER 2017 edition is located on our Products Catalog page and is available for download and printing from your home computer. The Products Catalog page is located on the toolbar to the left. We are working on our newest catalog which will be introduced before next spring. Our current newsletter is now available. It is available at busfixx.blogspot.com. We are currently discussing air conditioning components and their function in making a good system. In addition, we have our previous newsletters uploaded. We are constantly updating and increasing our feature items on our website. Be sure to bookmark this page and check back regularly to see what we have added. 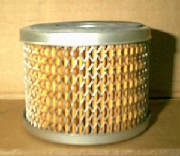 Also check out our engine, generator, remanufactured components and Webasto pages. We have many, many hard to find RTS parts in stock and ready for immediate shipment. If you do not find what you are looking for here, please contact us by phone, fax or e-mail so that we may assist you further. We look forward to doing business with you. Remember to check out our home page to see our "specials". Since we change our special frequently, if you don't see something that benefits you now, check back with us. Have you ever wondered.....? If you have, we may have the answers to some of those nagging general maintenance questions. We have added a "frequently asked questions" page to our site. While we will continually add new questions, we are currently focused on general maintenance. If you have a question that is not listed there, feel free to enter it and we will research it and post both the question and answer on our page. If you have a question, many others may have the same one. Take a minute, look at the questions and feel free to pose one of your own. Click on the link below for an interesting walk through the history and making of the 50DN alternator - the alternator most often used on motorcoaches. After reading the information provided the importance of using a qualified rebuilder will be more than obvious. So, take a minute to take a look. Take a look at the following below to see what you might be missing on your annual service. The service list contained in our link is the type used by major transportation companies throughout the nation. It contains all items necessary to meet all D.O.T. requirements. Feel free to print a copy for your future reference. We have just received new stock items for RTS! Many of these items are hard-to-find body parts including driver panels, hinges, aluminum spacers etc. We will be showcasing them over the next several weeks! They will also be a new addition to our latest catalog which will be available online shortly. Check back for an update on these new items! 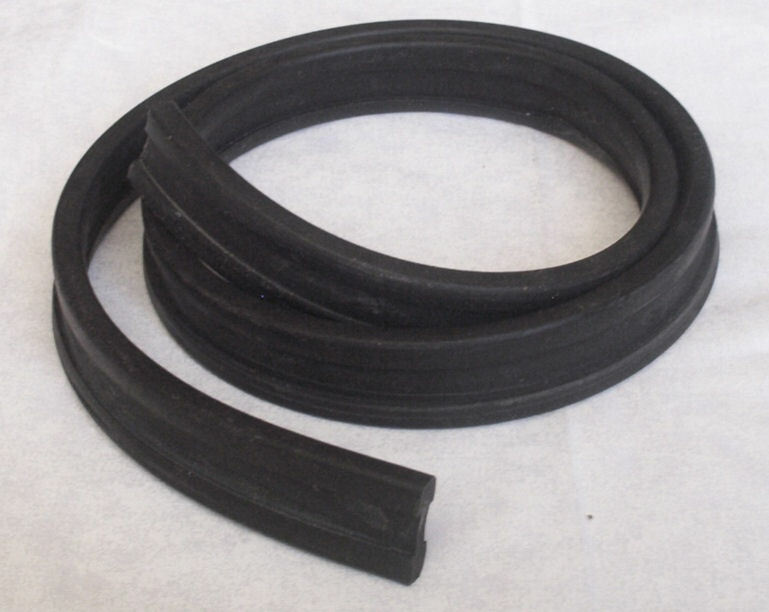 These polyurethane stablizer rod busings can withstand oil, fuel or heat and improve riding stability. These cost a little more than rubber, but once installed you can forget having to replace them again. Original Duro 50 are also available. We are now stocking front and rear brake chamber assemblies for the 04 an 06 RTS coach. Use the link below to go directly to our store. We stock complete emergency exit hatch units that are ready for immediate installation. Please give us the length and width of your unit. Call today for pricing. Our newest item offers substantial savings to RTS coach owners who have a V731 electronic transmission. Our featured product is the O.E. shifter cover kit. Compare our price to that of Detroit Diesel and save today! WOW! Have you been looking for that lighting lens cover and have been unable to locate one? We have a substantial inventory of this lens and many others for both your dash and your coach body. Check us out today! Introducing......while this is not a new item for us, it is a new item for our web page. 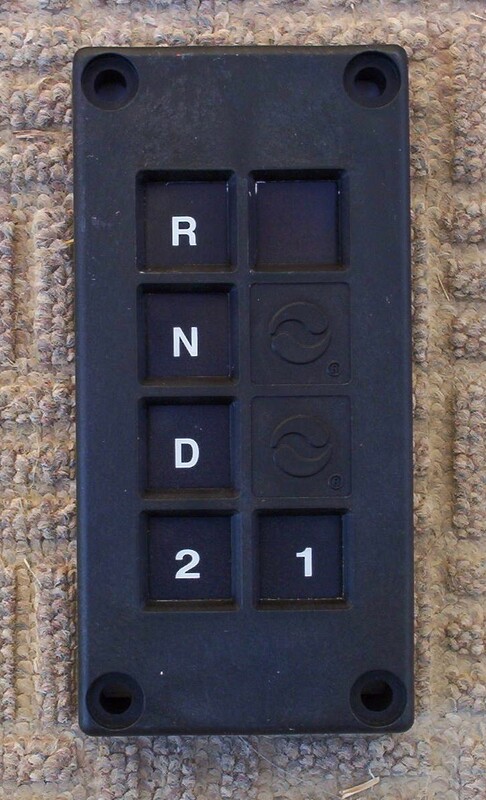 If you are getting water up inside your dimmer switch, we have just what you need. We stock the original cover that will protect your switch from the rain and grime .Yes, we have the dimmer switch's as well. 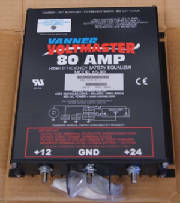 New 12/2010 VANNER, 65-80 Amp. This equalizer is capable of taking care of all of your needs. Call for your pricing on these brand new units. Beautify your coach while increasing your visibility. 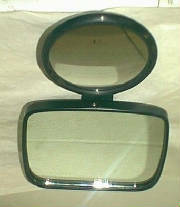 Brand new mirrors with 6" convex are now available. 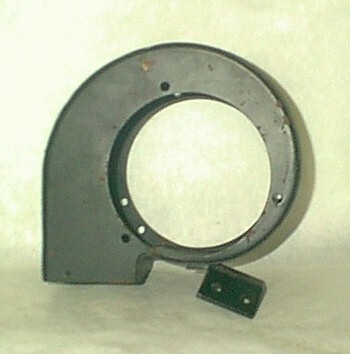 Part number is the same for both sides of the coach. The better the air bag condition.....the better the ride! We stock all the air bags for your RTS! The bag pictured above is the rear bag. 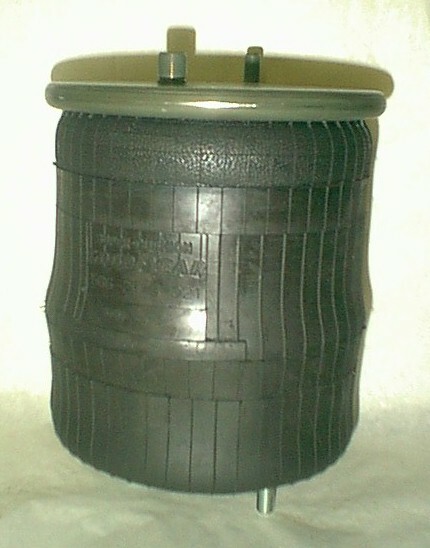 We sell it as a complete unit including piston for quick and easy installation. When ordering front bags, be sure to check whether you have solid or independent suspension. 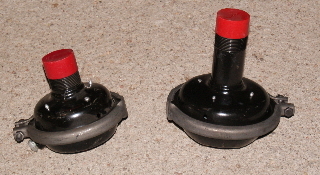 The bellow assemblies for each ARE different. This is a Honeywell gradustat which is no longer manufactured. We are the only company that can offer a factory new unit (while supplies last) and or a factory quality rebuildt. But, not to worry. Our reman. units carry the same guarantee as the new ones. Radius Rod Bushings - Now available in rubber or polyurethane. If you're shopping for circuit breakers that are original RTS, we are the place to come to. We have circuit breakers from 3 amp to 145 amp. Call BUS SERVICE for your electrical needs. More electrical....We stock all the Bosch type relays, seen on the left, including diode suppressed from 15A to 75A. 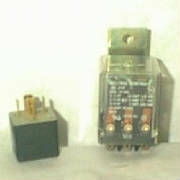 Multifunction relays, pictured on the right, are all available in either 12V or 24V. Good air circulation starts at the door! This housing is for the driver's air conditioning and defrost motor. In addition, the blower wheel is also available, drive motor and motor parts all control switchs. compressor parts for GB, Crog, TK and, Carrier Condensor and evaporator motors and parts, expansion valves, service valves, update TK clutch kits, clutch coils both 12 & 24 VDC. We stock upper amber and red round clearance lights, front and rear tail, stop and turn lamp assemblies, side markers, reflectors, sockets, 12-24 vdc bulbs, turn signal switch's, sealed beams. Weatherpak , Metripak, Deutsch connectors and accessories. Quality high temp. primary wire in 8 colors. LIGHTS, LIGHTS AND MORE LIGHTS!!! We stock all style of lights from markers to tail lights, side marker lights and "reflex" markers. This particular hinge rubber works for both the baggage bay hinge and the fold down windows. We sell this product, cut to length, by the foot. If you need 1 foot or 100 feet, we can accomodate your needs. Do you know someone who is need of the products or services that we have? Feel free to give our company information using the link below.